Over the next few weeks I will be featuring female entrepreneurs in the fitness industry who have opened their own studios. These ladies are rock stars. First up is Carrie Delozier the owner of barre54 which is located in Orlando, FL. According to her website, barre54 offers a full body, cardiovascular workout using the Lotte Berk exercises fused with pilates and yoga stretches,using a ballet barre. Each 54-minute class features a mix of isometric exercises and orthopedic stretches that challenge every muscle in the body, creating long, lean, supple muscles and strong, sculpted physiques. 1 What is your background? My passion for being “heart healthy” began at the age of 16 years old. I worked at a fitness club in Atlanta, GA where I ran the front desk and I was able to partake of all the classes they offered. In addition, I grew up playing tennis, running and hiking. Barre was a great fit for me because I have always loved yoga and pilates. I was sold from my very first barre class! 2 Why and how did you start your business/ open your studio? I started taking barre in Nashville, TN and watched the transformation in women of all ages. It was addictive in such a great way! Due to my lower back issues, I ventured out for alternatives and found that barre is my cure. By far, it is the best core workout that I have done and I felt like I needed to share with my friends in Orlando. 3 Did you face any challenges when you decided to open the studio that you would like to share, and how did you overcome them? Living in Nashville and running two studios in a completely different state can be quite a task. I surround myself with a supportive talented group of women. They love what they do and that makes all the difference! 4 Describe yourself and the Barre54 workout. I am a mom of 3 children: two teenage girls and an 8-year-old boy. They are my first priority and keep me busy! Barre 54 is a like another child that I nurture and mother. My desire was to create a workout that is challenging enough to keep your mind focused on YOU for an hour. The workout is 54 minutes of great music along with a mix of pilates and yoga stretching. YOU decide how much you will challenge yourself that day. I want my clients to leave feeling stronger and stand a little taller loving every inch God has given them. 5 What is your greatest business accomplishment? At the beginning of my journey, I was offered a franchise and decided to take my own path. Previously, there had not been any barre studios open in the Orlando area and introducing a new workout concept without the help of a franchise was by far my greatest challenge, but my greatest accomplishment. I LOVE our brand. I love the positive vibe in the studios and the ability to control the choreography. 6 What does your personal fitness routine include? I run, swim, play tennis and do barre. 7 What does a typical work day look like for you? I start the day with email and texts to teachers and staff, then head to workout. It clears my mind and gives me a chance to breathe. Afterwards I head back home to return emails, work on choreography, and marketing for a few hours. I tend to check schedules and work a little around dinnertime. We have busy evening classes, so I like to be available to help at any point. I travel to Orlando once a month for 4 days to be in the studio and with clients. 8 What is your eating philosophy? I grew up in a household without junk food, so I naturally gravitate toward healthy foods. I don’t use a freezer at my house and I love fresh. I do believe that one can do everything in moderation. Also, I am not a big fan of fad diets, or depriving yourself of a craving. I went on the Adkins diet once, it lasted a day and then I ended up at Dairy Queen! 9 What is your favorite brand of fitness clothing? My favorite brand would have to be Lululemon but I do believe it’s important to expand and include local vendors. We carry Ahimsa (from Chattanooga, TN), Onzie, Karma, and Splits 59. 10 Do you have any advice for future female entrepreneurs? Be open to learn from those around you. I have no pride when it comes to my business and figuring out what works. LISTEN and RESEARCH. Information is power. Do your homework and work hard. And most importantly, surround yourself with smart and talented people. Thanks Carrie for agreeing to the interview. An interesting fact about the name of the studio, the 54 is for the length of the workout and after studio 54 for the music. 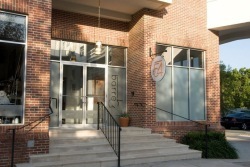 If you are in the Orlando area, take a few classes at barre54.